Finally, I have a new card to share with you! The papers are from the CD too! The square card base is 8x8inches. The fairy is decoupaged using gel glue for dimension. I cut out the background image using a spellbinders circle die. 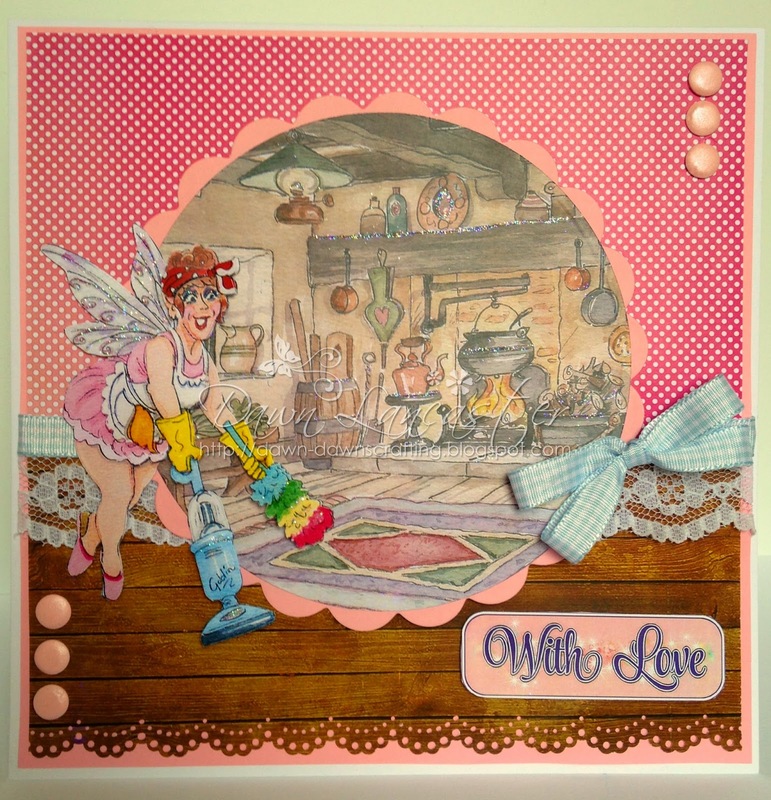 The pink CS mat was cut with a spellbinders scalloped circle die. I used my favourite Martha Steward Doily punch for the border. & of course a touch of glamour dust. The inside of the card is decorated too. Not sure if you can see the sparkle in the photo below! I do hope you like my card! they're flying off the shelves! Love this card Dawn, great image & the inside looks lovely too! Sure wish I had a cleaning fairy lol! I'm loving these new designs and what you've done with this one. 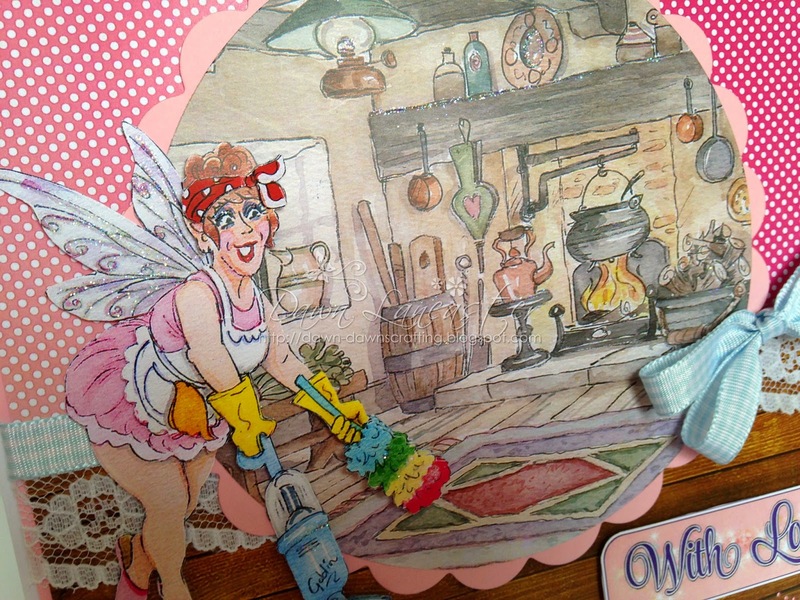 I reckon we all need a cleaning fairy! What a creative and fun card (I need a cleaning fairy)!! Thank you for joining us at "The Shabby Tea Room" for our "Pop of Pink" challenge! Oh I need one of those Cleaning Fairies at my house for sure!! Too much time spent on crafting and not enough on cleaning these days! This is so much fun! Thanks for playing along with us at Scrapy Land Challenge #13! A fabulous card Dawn, I think I could do with a cleaning fairy - a great design and beautifully finished on the inside as well. Hi Dawn, this is fabulous, I could definitely do with one of those cleaning fairies here. Oh my goodness, this is so fun! What a great image and design. Thanks for joining the Craft-Dee BowZ March Challenge, "Anything goes and include a handmade bow". Hello Dawn, Your card made me smile, I could certainly do with one that's for sure. A fabulous card and image. Love the background. Dawn this card is lovely it certainly put a smile on my face. This is just too cute! Definitely makes me smile. I do wish I had one of these cleaning faries. What a really fun card that's bound to bring a smile to the face of the recipient. Oh, I definitely need one of these fabulous 'Cleaning' fairies, Dawn. Loving the pink and brown and how you did the circle of background for the room. Fabulous design! Thanks for playing along with us at Scrapy Land challenge!! I love your card, great work. Thanks for joining us at The Paper Shelter.